I’m having trouble determining if this plugin will meet our requirements. – Some products are ineligible to receive the wholesale discount under any circumstances. – For some products, there are digital (zero-weight / file download) and physical (CD-ROM) variations. Wholesale should only be applicable to the latter. – The wholesaler customer must have a minimum total quantity of qualifying items in order for these items to have the discount applied. – Wholesalers are exempt from paying sales tax. Ideally there will be an additional field for such users to provide their tax ID #. Can the plugin do this? and/or are these on the roadmap? I’m a current customer and am hoping for these features also. 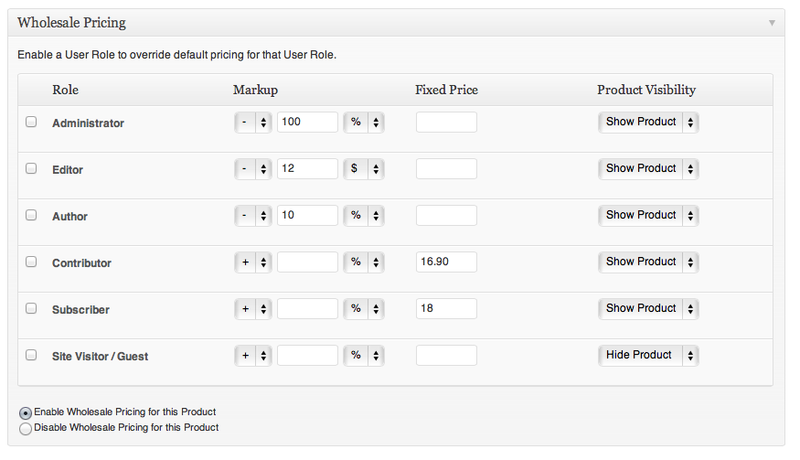 Hi BrendanL79, in the latest Plugin update I’ve added support for disabling Wholesale Pricing on a per-Product basis. Currently there is no ability to turn on/off Wholesale Pricing on a per-Product variation basis. So I’ve updated to 1.6.1 and it has instructions for the product variations, through when i add the code it breaks the page and no products show. Are you able to show where in the code to embed the code. Does anyone know how to get the per product variation working..? Anyone?? I need it to work badly!? When do you plan to update it? And third: Do you have a tip for us how to execute a mass product pricing (with more 100 products) ? But the most important thing is the product variations. Hello, I have a client whom I’m trying to help, who has a WP e-Commerce store combined with a Membership Association website, so the products need the ability to have Membership and Non-Membership pricing. Would this plugin be applicable? Thank you! 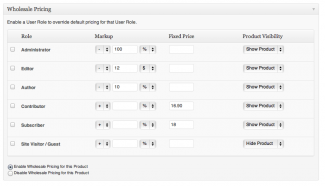 Hi Mare, if you create a custom User Role and configure it within your membership Plugin that new customers are assigned to it Wholesale Pricing can do the rest. Not wanting to be a bore, but what are the chances of the hide non-wholesale feature being available anytime soon? I am struggling to figure it out with other custom user plugins. I tried to download 1.6 from the premium update page and it still has 1.5.1 for download. I guess my today is almost over and your today still has daylight hours. Will you let me know as soon as it is available for download? Don’t think I ma getting it to work. If I go into the product that is not for wholesale and click hide product for the user role that is my wholesale login (in this case contributor) then that product should not be visible when I am logged in as a contributor, right? I deactivated User Role Editor plugin just in case. But all the products are still showing . . .
Good to see there are more updates and you are actively working on the product. However will this version work for the few users that the prices werent changing? It still deosnt seem to change the price so matter what settings i apply. Is there a way to check what the problem is like a debug file or anything? I’m still having trouble getting the per product pricing working. Hi Michael, after upgrading to 1.5 I couldn’t get the wholesaler plugin to work. Tried updating to 1.5.1 and had my fingers crossed… and still no joy??? I’m sure I have the snippet in the correct spot. Any suggestions, maybe re-install? Sorted.. I’m such a tool, didn’t read all the instructions did I! Hi Charlie, please make sure you’re not logged in as an Administrator when confirming that the markup/markdown is working. Feel free to send me login details so I can look into this further with you. I bought this plug in about a month ago and it has not worked yet. I have been told its being fixed and have not heard back. I have to explain this to all my registered users now and its very annoying. I’m trying to use the product based wholesale pricing, though the price is not changing. When I use the global wholesale pricing the product page pricing doesn’t change but the shopping cart price is correct. Ok, got the global pricing fixed, I forgot to re editing the product-template.php file. I’m dunskii, good stuff, I’m working with the WP e-Commerce team to get that patch added into Core. 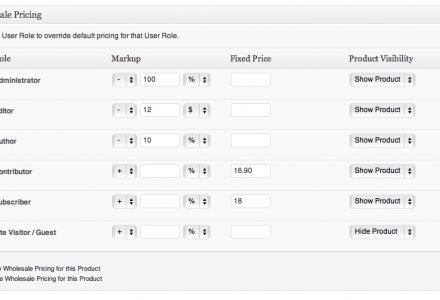 I’m still having trouble getting the product page wholesale pricing to work…. mmmm… its there anything special I need to do? I really need this plugin but when I activate it, my sidebar shopping cart widget stops updating itself. Has this happen to anyone? Is there a way to avoid this? Solved! Thank you! the 1.5.1 works perfectly! Hi. Firstly, thank you for an awesome plugin. Any news on this yet or perhaps you have an idea where the conflict could be? I’ll take a look on my side as well and let you know if I find anything. Hi Jef, have upgraded one of my development sites to 3.8.3 and will work to reproduce tomorrow; otherwise definitely the next day. I’ll be in transit tomorrow between Thailand and Laos where internet access is scarce, EDGE at best, while on the road. Hi Jef, have reproduced the issue, actively working to resolve and get a Plugin update out. Comparing changes between 3.8.2 and 3.8.3 to diagnose this. Awesome! Looking forward to using the plugin. Thanks for the great support. Just discovered that on my setup, the problem only exists when logged in. Log out and it works perfectly. Hope that helps. Have you managed to fix the issue with 3.8.3? Hi Kim, all sorted, please update to 1.5.1 from the Premium Plugin Updates. I purchased this plugin and am getting multiple errors. I have emailed you the errors and details directly. Can you please confirm that you have received this? I’m looking for a solution that handles volume discounts by user role, as well as the percentage/value based discounts. Is that possible with this plugin? To clarify…once a user logs in, they see a tiered pricing structure (based on a certain role) and pricing for 1-6 units is $10, 7-12 units is $9, and so on. I need this features as well. Have you put that feature vote up as yet? I would love to see where I can give a category of numerous products a separate retail and wholesale price. Example: I have a category of Duvet Sets. There are 20 different duvets, but they are all the same price. I will have to add a wholesale price to each product as it stands now, right? Would be great if I could apply the price to an entire category. What happens with variations when applying wholesale pricing? Hi Kim, I’ve added a Feature Roadmap poll to each Plugin. Start voting! Does this work on a per product basis or is it still only general settings for the entire catalog? I also want per product pricing. Another nice addition to that would be the possibility of applying one price to a batch of products under a particular category. Making it complicated of course . . .
With regards to the “just around the corner”; how far away is that corner? Weeks or months? I need to know if I must get some custom coding done or not? Spinning up this feature today, hope to have a stable release ready in the next few days! Took a lot less time than I thought to develop, just working on legacy WP e-Commerce 3.7 support then will update the latest release. Expected time is less than 3 hours away!